Well now I'm all excited! I like how the ki abilities are ordered into the different categories now, as skills, school, and combat general; the schools should be interesting to see indeed! This might be where you think to restrict samurai normally to one school, somewhat like the UA clan feats (was it clans, or bloodlines? You know what I mean? ), and then maybe have a feat that allows for one to learn a school's ki-abilities, without getting the feat ability. To show dabbling, but not actual dedication. Then you can get somewhat more creative with the schools. Just tossing that at you, make of it what you will. What were you considering for school abilities thus far? Okay I'm listing fighting styles now, if I miss an unarmed fighting style, kenjutsu school, or weapon style the Samurai would usually know, please inform me. Apparently the Manriki-Gusari was invented by a Samurai to bloodlessly disarm people at the imperial castle, but it's use was quickly adopted by the ninja clans (or so spurious internet articles inform me). Should I include it in the styles since it was only used briefly by the samurai, and only in certain areas? Weapon Proficiencies: Ashigaru are proficient with all Simple Weapons. They are proficient with light and medium armor, light and heavy shields, but not tower shields. Ashigaru are also proficient with any 4 other weapons representing the farming implements they substituted for actual combat weapons, or whatever they could loot from the battlefield (or occasionally were even trained to use). Usually they fought with Yari and Yumi, though eventually many were trained with the Teppo and Pike (Nagae Yari) as well. Many were allowed to carry the Wakizashi, but not until late in the period in which they thrived were they allowed Katanas. 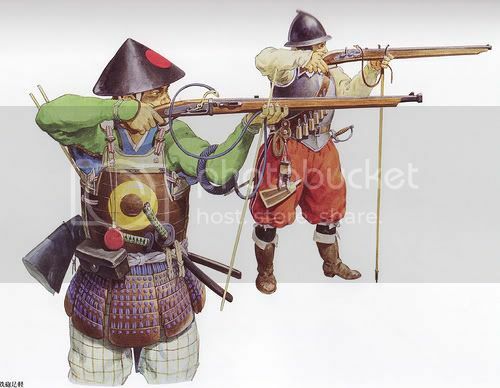 Military Training (Ex): The Ashigaru is a military occupation primarily, and players can receive training at various military skills as long as they remain Ashigaru. It gives you Bonus Feats at levels 1, 4, 7, 10, 13, 16, and 19 from the following list (you must still meet prerequisites, your Ashigaru Levels are considered levels in Fighter for purposes of acquiring Weapon Focus, Weapon Specialization, and related Feats): Canny Opportunist, Choke Hold, Close-Quarters Fighting, Combat Expertise, Combat Intuition, Combat Reflexes, Danger Sense, Defensive Sweep, Deft Opportunist, Deft Strike, Distracting Attack, Earth's Embrace, Evasive Reflexes, Expert Tactician, Far Shot, Greater Weapon Focus, Greater Weapon Specialization, Hold the Line, Improved Critical, Improved Grapple, Improved Unarmed Strike, Improved Initiative, Improved Precise Shot, Improved Trip, Intimidating Strike, Kiai Shout, Martial Throw, Melee Weapon Mastery, Mounted Archery, Mounted Combat, Overwhelming Assault, Penetrating Shot, Point Blank Shot, Power Critical, Precise Shot, Prone Attack, Quick Draw, Ranged Weapon Mastery, Rapid Assault, Sharp-Shooting, Stand Still, Telling Blow, Weapon Focus, Weapon Specialization. Races: Pretty much the same as the usual Samurai. Ki Pool (Ex): At 1st level the Onna-Bugeisha first begins to learn to channel her Ki to perform acts she would be otherwise unable to do. She may use her Ki a number of times per day equal to either her Charisma or Wisdom Modifier (whichever is greater) plus once more per day for each level of Samurai she takes. 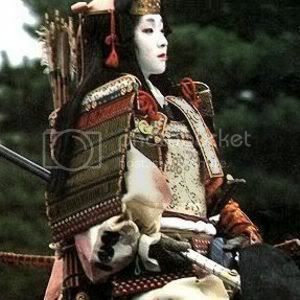 Military Training (Ex): The Onna-Bugeisha is a military occupation primarily, and players can receive training at various fighting styles as long as they remain Onna-Bugeisha. It gives you Bonus Feats at levels 1, 4, 7, 10, 13, 16, and 19 from the following list (you must still meet prerequisites, your Onna-Bugeisha Levels are considered levels in Fighter for purposes of acquiring Weapon Focus, Weapon Specialization, and related Feats): Canny Opportunist, Cavalry Charger, Choke Hold, Combat Expertise, Combat intuition, Combat Reflexes, Defensive Sweep, Deft Opportunist, Earth's Embrace, Evasive Reflexes, Far Shot, Greater Weapon Focus, Greater Weapon Specialization, Improved Critical, Improved Grapple, Improved Unarmed Strike, Improved Initiative, Improved Mounted Archery, Improved Precise Shot, Improved Trip, Kiai Shout, Martial Throw, Mounted Archery, Mounted Combat, Oversized Two-Weapon Fighting, Power Critical, Precise Shot, Point Blank Shot, Quick Draw, Prone Attack, Ride-By Attack, Sharp-Shooting, Spirited Charge, Stand Still, Telling Blow, Trample, Weapon Focus, Weapon Specialization. The Pechin's class skills (and the key ability for each skill) are are Bluff (Cha), Climb (Str), Concentration (Con), Craft (Int), Diplomacy (Cha), Gather Information (Cha), Intimidate (Cha), Jump (Str), Knowledge (Geography, History, Local, Nobility & Royalty, War)(Int), Listen (Wis), Perform (Cha), Profession (Wis), Ride (Dex), Sense Motive (Wis), Spot (Wis), Swim (Str), and Tumble (Dex). Weapon Proficiencies: Pechin are proficient with all Simple Weapons, and Light and Medium Armor. They are proficient with light and heavy shields, but not tower shields. Pechin are also proficient with any 4 other weapons representing the farming implements they substituted for actual combat weapons once they were forbidden to go armed. Usually this will be weapons common to Kobudo. Ki Pool (Ex): At 1st level the Pechin first begins to learn to channel his Ki to perform acts he would be otherwise unable to do. He may use his Ki a number of times per day equal to either his Charisma or Wisdom Modifier (whichever is greater) plus once more per day for each level of Pechin he takes. Military Training (Ex): The Pechin is a military occupation primarily, and players can receive training at various fighting styles as long as they remain Pechin. It gives you Bonus Feats at levels 1, 4, 7, 10, 13, 16, and 19 from the following list (you must still meet prerequisites, your Pechin Levels are considered levels in Fighter for purposes of acquiring Weapon Focus, Weapon Specialization, and related Feats): Canny Opportunist, Cavalry Charger, Choke Hold, Combat Expertise, Combat Focus, Combat Intuition, Combat Reflexes, Defensive Sweep, Dodge, Earth's Embrace, Eyes in the Back of Your Head, Far Shot, Greater Two-Weapon Defense, Greater Two-Weapon Fighting, Greater Weapon Focus, Greater Weapon Specialization, Heavy Armor Optimization, Improved Critical, Improved Grapple, Improved Unarmed Strike, Improved Initiative, Improved Trip, Improved Two-Weapon Defense, Improved Two-Weapon Fighting, Kiai Shout, Lightning Reflexes, Martial Throw, Mounted Combat, Oversized Two-Weapon Fighting, Power Critical, Precise Shot, Point Blank Shot, Quick Draw, Prone Attack, Ride-By Attack, Snap Kick, Spirited Charge, Stand Still, Stunning Fist, Superior Unarmed Strike, Trample, Two-Weapon Defense, Two-Weapon Fighting, Weapon Focus, Weapon Specialization. Unarmed Fighting (Ex): At levels 3, 6, 9, 12, and 15 the Pechin gains a cumulative +1 Bonus to Ac if he is unarmed. If he is unarmored and carrying a Light Load or less, he also adds his Wisdom Modifier to this Bonus. At 6th Level is your Unarmed Fighting Bonus is enough to cause an opponent to miss you, you may switch places with him as a Swift Action, and his turn ends. At 12th Level if your Unarmed Fighting Bonus is enough to cause an opponent to miss you, you may instead make an Attack of Opportunity against him. At 18th Level when Unarmored and using Total Defense, you can make a Reflex Save (DC is 10 plus 1/2 your opponents Hit Dice plus his Strength Modifier) to halve the damage. Let me know if you like the revised Pechin. If so I'll do up the Yamabushi and Sohei, and then fire up teh Feats and Ki stuff. The Sohei are lay members of Buddhist monasteries. They handle various secular activities such as construction and defense of the temples. The Sohei are also responsible for making the monks thoughts known about political appointments of Abbots and other priests via demonstrations, riots, and occasionally armed rebellion. Most of the monastic orders vie for riches and political power as much as any noble, and they don't like the member of a different order being placed as an Abbot of their own. Or perhaps they belong to different sects of Buddhism. Sohei are often fanatic warriors devoted to their particular order more than Bushido. In fact they generally fought more with rival sects of Buddhists for political and social power than they did the Samurai (especially since the few times they did interfere in secular politics they paid a heavy price for it with the burning of their temples. Many relied on the superstitious fears of the commoners to intimidate them based on their 'holy' status, as opposed to the Samurai's more straight forward ability to simply murder them at any time. Also, unlike the Samurai you are expected to behave as Monks instead of being accomplished warriors/artists. Abilities: Unlike most Samurai your Wisdom plays a more important role as your Ki abilities work off of Wisdom alone. Particularly the few Divine abilities you will be getting. As you are also a warrior and required to fight you will need physical Abilities to be in good condition as well. Races: Sohei are members or Buddhist monasteries, so only races with he Buddhist religion will have them. Alignment: In keeping with Buddhism most Sohei are Neutral, or at least strive to be. They can be oddly passionate in defending their monasteries and faith considering Buddhism's rejection of personal desire. The Sohei's class skills (and the key ability for each skill) are Appraise (Int), Bluff (Cha), Climb (Str), Concentration (Con), Craft (Int), Intimidate (Cha), Jump (Str), Knowledge (Arcana, History, Local, Nature, Nobility & Royalty, Religion, War)(Int), Listen (Wis), Profession (Wis), Ride (Dex), Sense Motive (Wis), Spot (Wis), and Swim (Str). Weapon Proficiencies: Sohei are proficient with Simple and Martial Weapons and with Light, Medium, and Heavy Armor. They also have proficiency with any one Exotic Weapon. Ki Pool (Ex): At 1st level the Sohei first begins to learn to channel his Ki to perform acts he would be otherwise unable to do. He may use his Ki a number of times per day equal to either his Wisdom Modifier plus once more per day for each level of Sohei he takes. Military Training (Ex): The Sohei is a military occupation primarily, and players can receive training at various military skills as long as they remain Sohei. It gives you Bonus Feats at levels 1, 4, 7, 10, 13, 16, and 19 from the following list (you must still meet prerequisites, your Sohei Levels are considered levels in Fighter for purposes of acquiring Weapon Focus, Weapon Specialization, and related Feats): Canny Opportunist, Choke Hold, Close-Quarters Fighting, Combat Expertise, Combat Intuition, Combat Reflexes, Danger Sense, Defensive Sweep, Deft Opportunist, Deft Strike, Distracting Attack, Earth's Embrace, Evasive Reflexes, Expert Tactician, Far Shot, Greater Weapon Focus, Greater Weapon Specialization, Hold the Line, Improved Critical, Improved Grapple, Improved Unarmed Strike, Improved Initiative, Improved Precise Shot, Improved Trip, Intimidating Strike, Kiai Shout, Martial Throw, Melee Weapon Mastery, Mounted Archery, Mounted Combat, Overwhelming Assault, Penetrating Shot, Point Blank Shot, Power Critical, Precise Shot, Prone Attack, Quick Draw, Ranged Weapon Mastery, Rapid Assault, Sharp-Shooting, Spinning Halberd, Stand Still, Telling Blow, Weapon Focus, Weapon Specialization. Iron Will (Ex): At 2nd level the Sohei gains Iron Will as a Bonus Feat. At 5th level the Sohei gains Indomitable Soul as a Bonus Feat (see PHB II). At 8th level gains Mind over Matter. Once per round when targeted by an effect that requires a Fortitude or Reflex Saving Throw, the Sohei may opt to use a Willpower Save instead. At 11th level the Sohei can make a Concentration Check to temporarily ignore any Mind-Affecting effect for a number of rounds equal to his Wisdom Modifier. The Check DC is equal to the original Save DC of the effect. At 14th level the Sohei gains a +4 Resistance Bonus on Willpower Saves against Mind-Affecting Effects. If a Mind-Affecting Effect would cause him to break his monastic vows (for example a Charm or Compulsion spell was cast on him, and he was ordered to commit an act that society would object to) he gains a second Saving Throw to escape the effect. At 17th level the Sohei is immune to Fear and Morale based penalties. Holy Man (Su): You are protected by the Gods, and those who attack you risk curses or even death. Each time you choose to use your Holy Man ability you expend one daily use of your Ki Pool. At 3rd Level anyone attacking the Sohei with a melee or ranged attack must make a Willpower Save (DC is 10 plus 1/2 HD plus Wisdom Modifier) or be affected as if by a Blindness/Deafness spell. At 6th Level anyone attacking the Sohei with a melee or ranged attack must make a Willpower Save (DC is 10 plus 1/2 HD plus Wisdom Modifier) or be affected as if by a Bestow Curse spell. The Sohei can use an effect from a lower level instead if he wishes. At 9th Level anyone attacking the Sohei with a melee or ranged attack must make a Willpower Save (DC is 10 plus 1/2 HD plus Wisdom Modifier) or be affected as if by a Feeblemind spell. The Sohei can use an effect from a lower level instead if he wishes. At 12th Level anyone attacking the Sohei with a melee or ranged attack must make a Willpower Save (DC is 10 plus 1/2 HD plus Wisdom Modifier) or be affected as if by a Harm spell. The Sohei can use an effect from a lower level instead if he wishes. At 15th Level anyone attacking the Sohei with a melee or ranged attack must make a Willpower Save (DC is 10 plus 1/2 HD plus Wisdom Modifier) or be affected as if by a Symbol of Death spell. The Sohei can use an effect from a lower level instead if he wishes. At 18th Level anyone attacking the Sohei with a melee or ranged attack must make a Willpower Save (DC is 10 plus 1/2 HD plus Wisdom Modifier) or be affected as if by an Energy Drain spell. The Sohei can use an effect from a lower level instead if he wishes. Abbot (Su): At 20th Level the Sohei can extend your Holy Man Ability to include all Allies within 30' as a Standard Action for 3 rounds plus a number of rounds equal to your Wisdom Modifier. You still have to expend a daily use of your Ki Pool whenever an Ally is successfully attacked if you wish to use the Ability. The peasants (and to some extent the less reasonable Samurai) can be intimidated by your status as a holy man. Claims of people being struck dead by the Buddha for simply daring to oppose you are common, and you do your best to inflame those rumors. After all they may come in handy when you need to pull your behind from the fire, or convince the peasantry to hide you from the Samurai by not mentioning which way you left town if asked. Religion: Sohei are Buddhists, but there are conflicting monastic orders, as well as conflicting versions of Buddhism (Pure Land vs Zen being the best known). Most Sohei are fairly devout (at least if they want to keep their divine powers), and are required to be fairly fanatic in their allegiance to remain within the temples favor. Other Classes: The Samurai and the Sohei often do not get along as they have differing (sometimes opposing) goals, and usually they try to co-opt or murder one another. Also the Sohei are allowed to associate publicly with people the Samurai can't, so they are a bit more accepted in some areas (or perhaps less accepted depending on their religious beliefs and their intensity). In general the nobility wants to either befriend or extinguish them, other religions are considered enemies (along with associated classes), and they don't get along with gaijin anymore than any other Japanese. Combat: Much like the Ashigaru you gravitate towards new or exotic weaponry, both as a means of keeping up with the times and to intimidate others. Generally each temple has a specialty along with the ever present Naginatas they favor. Advancement: Advancement for you depends on what your order needs you to do. After all besides being a monk, you are also a lay brother responsible for many day to day chores, and for defense of the monastery. What you become depends on their needs, unless you're willing to strike out on your own (which could be deadly for you). The common folk do not see you much since you spend all your time training at temples, usually in the mountains. The nobility send you gifts in attempts to curry favor, but they rarely leave their own power bases to do so. Generally you interact with the peasantry for sundry means such as getting supplies, and the Samurai when fighting with or against them. Daily Life: Your daily life is composed of prayer, training, and chores. You are expected to do well at all of them. If not your daily routine consists of punishment. Whenever the temple needs to be defended, or trouble stirred up, or people killed you may also be called upon. Organizations: All Sohei belong to a Buddhist monastery and the brotherhood of monks within, even if they themselves are lay members. NPC's are generally terrified of you. They have no idea what you're up to or what you want when you appear, and acting against you may be prohibited by the Gods. Also the Samurai may want you dead, so your mere appearance is a possible harbinger of death and chaos. This class can monkey wrench campaigns depending on what the other PC's are, as the Sohei's orders may conflict with the parties goals (especially if the rest of them are Samurai). Adaptation: This is probably best for campaigns with a focus on a Buddhist temple, as opposed to the court intrigues of the Samurai. Encounters: Sohei are encountered in riots and protests when their order feels it has been wronged, when their temples go to war with one another (or with the Samurai), or in most monasteries with any political power. Ki Pool The Epic Sohei gains 1 additional daily use of his Ki Pool for every Epic Level. He does not gain new Ki abilities except as Epic Feats. Yamabushi seem more like Clerics. I'll need to look at them more before doing them up. I just got a ton of stuff dumped on me this week (not all of it bad for a change). Lemme get caught up in real life and I'll get this fired back up). Almost have the Sohei fluffies done. If my research is wrong or anyone would like to chime in now is a good time. Sohei fluff is done. If no one wants any changes I shall finish off the last of the class abilities. Anyone have thoughts on the Holy Man abilities? "A single sincere prayer moves heaven. You will surely realise the divine presence through sincere prayer." Yamabushi are adherents of a spiritual religion known as Shugendo, a fusion of Shinto animist beliefs, Tantric Buddhism, Taoist magic, Shamanism, and other practices. They are wandering ascetics who meditate and study on lone mountains, usually alone or in small groups that go on pilgrimages. Early in their formation the Yamabushi had extensive contact with the early precursors of the Ninja clans, and are said to have remained in close contact with them forever after, and even hired them for protection. They are also known as Shugenja or Shugyosha. They seek long life, magical power, and enlightenment (not always in that order). Yamabushi are devoted to finding enlightenment (and in some cases magical knowledge). In either case you will need to avoid the temptations of the secular world for the spiritual. But your seclusion means you will need to be self-sufficient and capable of defending yourself against troubles. And you will find much to trouble you in your travels. Abilities: Wisdom is of importance to all Yamabushi as their powers derive from it. Physical abilities will be necessary if you are also to be a warrior, and Charisma will be helpful for bluffing your way out of trouble. Given their focus on physical Endurance Con should be high. Races: Yamabushi are usually human, though some can be found among other species that are capable of solitude as well. Alignment: Yamabushi strive for Neutrality as most Buddhists do, but their magic studies often expose them to powers that may cause them to stray from that path. Starting Gold: Same as Cleric. Starting Age: Same as Cleric. The Yamabushi's class skills (and the key ability for each skill) are Appraise (Int), Balance (Dex), Bluff (Cha), Climb (Str), Concentration (Con), Craft (Int), Heal (Wis), Jump (Str), Knowledge (Arcane, History, Local, Nature, Religion)(Int), Listen (Wis), Profession (Wis), Ride (Dex), Sense Motive (Wis), Spellcraft (Int), Spot (Wis), Survival (Wis), Swim (Str), and Use Magic Device (Cha). Weapon Proficiencies: Yamabushi are proficient with Simple and Martial Weapons and with Light, Medium, and Heavy Armor. They also have proficiency with any one Exotic Weapon. Ki Pool (Ex): At 1st level the Yamabushi first begins to learn to channel his Ki to perform acts he would be otherwise unable to do. He may use his Ki a number of times per day equal to either his Wisdom Modifier plus once more per day for each level of Yamabushi he takes. Martial Studies (Ex): The Yamabushi need to study the martial arts to defend themselves due to their solitude, and players can receive training at various military skills as long as they remain Yamabushi. It gives you Bonus Feats at levels 1, 4, 7, 10, 13, 16, and 19 from the following list (you must still meet prerequisites, your Yamabushi Levels are considered levels in Fighter for purposes of acquiring Weapon Focus, Weapon Specialization, and related Feats): Canny Opportunist, Choke Hold, Close-Quarters Fighting, Combat Expertise, Combat Intuition, Combat Reflexes, Danger Sense, Defensive Sweep, Deft Opportunist, Deft Strike, Distracting Attack, Earth's Embrace, Evasive Reflexes, Expert Tactician, Far Shot, Greater Weapon Focus, Greater Weapon Specialization, Hold the Line, Improved Critical, Improved Grapple, Improved Unarmed Strike, Improved Initiative, Improved Precise Shot, Improved Trip, Intimidating Strike, Kiai Shout, Martial Throw, Melee Weapon Mastery, Mounted Archery, Mounted Combat, Overwhelming Assault, Penetrating Shot, Point Blank Shot, Power Critical, Precise Shot, Prone Attack, Quick Draw, Ranged Weapon Mastery, Rapid Assault, Sharp-Shooting, Spinning Halberd, Stand Still, Telling Blow, Weapon Focus, Weapon Specialization. Iron Will (Ex): At 2nd level the Yamabushi gains Iron Will as a Bonus Feat. At 5th level the Yamabushi gains Indomitable Soul as a Bonus Feat (see PHB II). At 8th level gains Mind over Matter. Once per round when targeted by an effect that requires a Fortitude or Reflex Saving Throw, the Yamabushi may opt to use a Willpower Save instead. At 11th level the Yamabushi can make a Concentration Check to temporarily ignore any Mind-Affecting effect for a number of rounds equal to his Wisdom Modifier. The Check DC is equal to the original Save DC of the effect. At 14th level the Yamabushi gains a +4 Resistance Bonus on Willpower Saves against Mind-Affecting Effects. If a Mind-Affecting Effect would cause him to break his monastic vows (for example a Charm or Compulsion spell was cast on him, and he was ordered to commit an act that society would object to) he gains a second Saving Throw to escape the effect. At 17th level the Yamabushi is immune to Fear and Morale based penalties. Shugendo (Su): At 3rd Level you may expend a daily use of your Ki Pool to cast Resist Energy (Caster Level is equal to Hit Dice). You also permanently gain the benefits of the Endure Elements spell. At 6th Level you may expend a daily use of your Ki Pool as a Free Action to cast Fly (Caster Level is equal to Hit Dice). At 9th Level you may expend a daily use of your Ki Pool as a Free Action to cast Commune (Caster Level is equal to Hit Dice). At 12th Level you may expend a daily use of your Ki Pool as a Free Action to cast Control Weather (Caster Level is equal to Hit Dice). At 15th Level you may expend a daily use of your Ki Pool to convert an opponent to Buddhism through speech. This requires a Standard Action, and is language dependent. If the target fails a Willpower Save (DC is 10 plus 1/2 HD plus Wisdom Modifier) you change his or her Alignment to Neutral or Neutral Good. Many Yamabushi use this to convert Oni. At 18th Level weapons refuse to kill you. Any time a weapon would do enough damage to kill you, you get a Sunder Attack against it as a Free Action. You do not provoke an Attack of Opportunity, and Size Modifiers are not included (nor are modifiers due to weapon type). You get your Wisdom Modifier instead of Dex or Str for the roll, and if successful you take no damage from the weapon, and your Sunder attack does 2d6 plus your Wisdom modifier in damage, and ignores the weapons Hardness. Holy Ascetic (Su): Your Divine Powers are such that you are now Immortal. Your Alignment changes to Neutral and may not be altered and you become an Outsider with the Native Subtype. You no longer require, air, food, or water, do not sleep, and do not age (and are immune to age and sleep effects). You are immune to all Diseases and Poisons. You are a mountain ascetic, little understood by others. The government occasionally views your religious beliefs and tenuous collusion with Ninja clans as a threat of some sort, and they do not like you. Banning of your religion is a common problem, as well as misunderstandings and accusations of sorcery. This only drives you further into seclusion, as the company of others is not necessary for enlightenment. Religion: A decent discussion of Shugendo would be too long to post here, but there is a pantheon of deities, and all Yamabushi are required to be members of the religion. Other Classes: The other Samurai classes will be deeply suspicious of you at best considering your sects occasional cross training with the Ninjas. You may be more open to associating with foreigners than the other Samurai style classes. 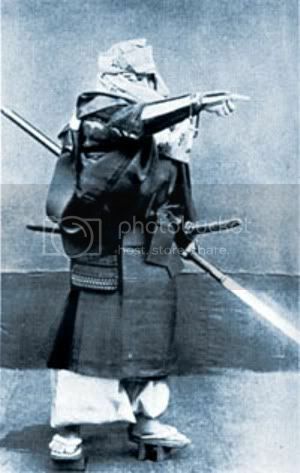 Combat: You prefer the Naginata like the Sohei, but you use swords and knives as much as any other Samurai class, and one group of Yamabushi were even famous for using rifles. Advancement: Yamabushi can go in more than a few directions. They can end up becoming spirits or achieving Enlightenment, specializing in some form of magic or martial arts, or spend their entire lives treading an uneasy path between these extremes. "What's he doing in town Ezo? Follow him and report back to me." With Yamabushi being hermits and loners they are not always well thought of, and misfortune is often blamed on them unfairly. Many are accused of collusion with Ninjas in committing assassinations or practicing black magic in order to provide an excuse for their execution or arrest. But they are also heavily consulted for good luck charms written on papers or in the form of amulets, divinations, to talk with spirits, or to exorcise the same. Daily Life: The Shugendo religion stresses physical endurance as being necessary to the path to enlightenment. Devotees fast, meditate under freezing waterfalls, chant sutras in the snow, or perform other daily acts of endurance to pray and show religious observance. Much of their time is spent in religious ritual or study, or practicing the martial arts to defend themselves. Notables: Daizu Hirono (Yamabushi 12) is a lone wanderer seeking spiritual enlightenment. Tsuruko (Yamabushi 6/Shamaness 6) is a local seer and allows herself to be possessed by SPirits for those asking advice. Organizations: While they are an religious organization, the Yamabushi are so loosely organized they are not considered a true physical presence (which is intended). If people thought they were organized enough to be a threat they might be put down. NPC's are terrified yet perversely attracted to the Yamabushi. They have helpful abilities, such as exorcising demons and spirits, but they also have many ugly rumors spread about them that put people off. 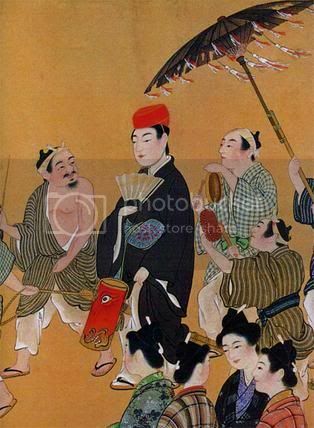 The Yamabushi are loners, and tend to invite trouble which could make their presence in a party difficult. The Yamabushi will resent having to take time from his studies to do other things even if only subconsciously. He will also attract unwelcome attention to the group. Adaptation: This is obviously intended for an oriental campaign with a strong Japanese influence. Encounters: Yamabushi can be found on pilgrimages, on mountain temples, or as lonely hermits in the middle of nowhere. Ki Pool The Epic Yamabushi gains 1 additional daily use of his Ki Pool for every Epic Level. He does not gain new Ki abilities except as Epic Feats. 1) If memory serves (big if), their fighting style was centered around the Halberd or its equivalent, in previous editions and historically. Opening up the Spinning Halberd feat to them may be appropriate. 2) "Willpower save" is referenced repeatedly. Is that just a standard Will save, or is there some differentiation that I've not been observant enough to catch? Will is just the standard shorthand for Willpower, similar to Fort => Fortitude and Ref => Reflex. Reflex doesn't get shortened as often, though, because it's only two syllables instead of three. The two terms are interchangeable.